As mentioned earlier, this month our beloved Tiny Overlord turned one year old. And, quite frankly, we felt we all deserved a good knees up. 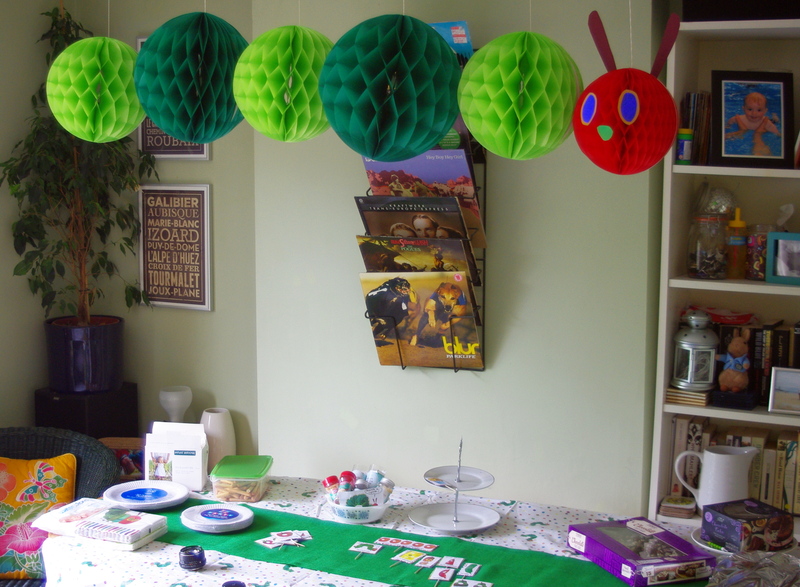 So we held a birthday party for family and some of his baby friends at our house, based on his favourite book – Eric Carle’s The Very Hungry Caterpillar. 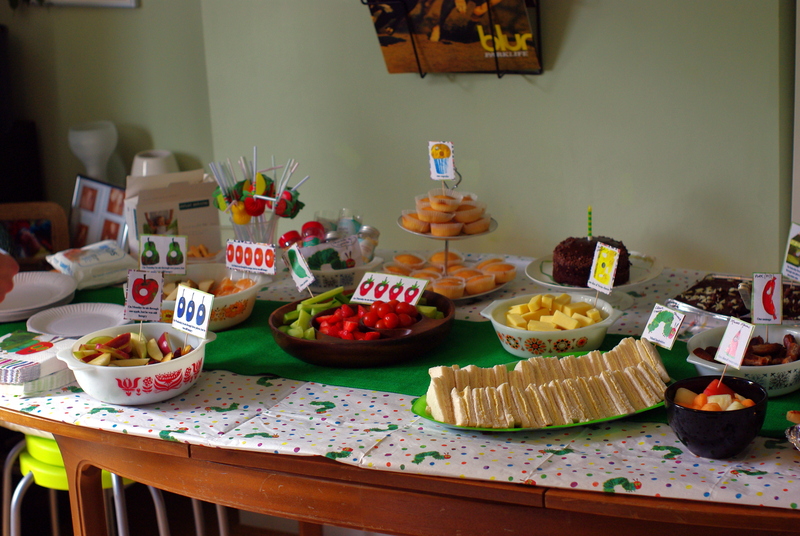 Thanks to Pinterest, I found free printable labels, so we could all eat our way through all the things the Hungry Caterpillar ate (the sandwiches were displayed on a ‘great big green leaf’ platter. Water wipes and disposible bibs (eco ones from Naty) were also on hand for our younger guests. 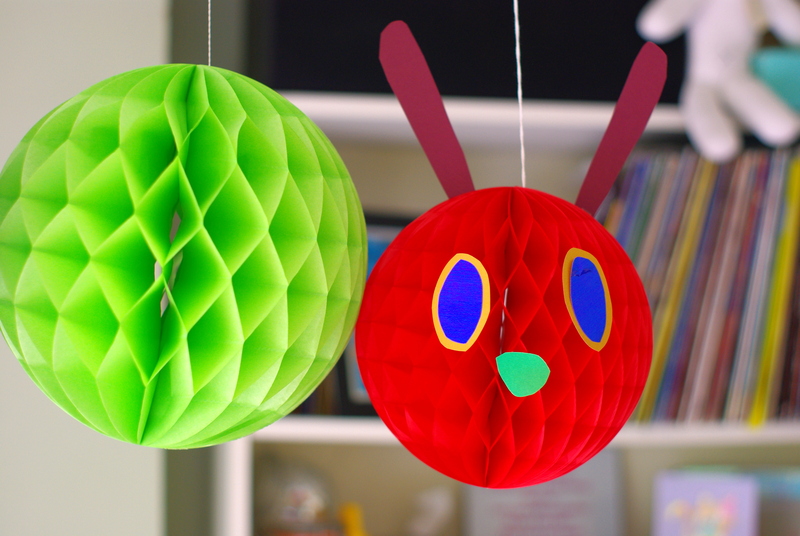 Though my proudest creation, is possibly the Hungry Caterpillar I made from large honeycomb paper balls (inspired by this). I hung it the day before and the Tiny Overlord squealed with delight when he saw it. We really haven’t had the heart to take it down yet, so the caterpillar is still hanging over our dining room table. We wave at it every morning when we are eating breakfast. 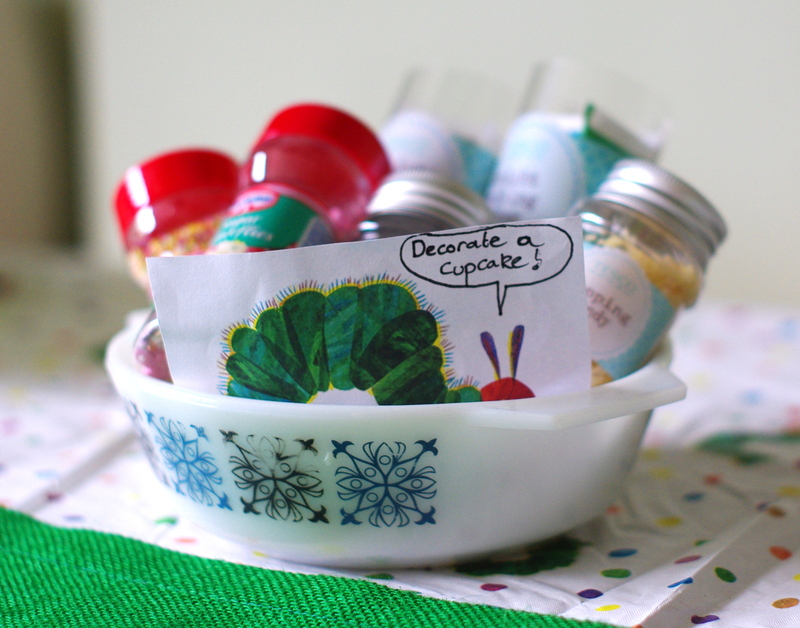 Not pictured are our ‘party bags’, which were colourful reusable snack tubs (8 for £1 in our local pound shop! ), filled with glittery homemade playdough and finished with a green leaf shaped parcel tag. 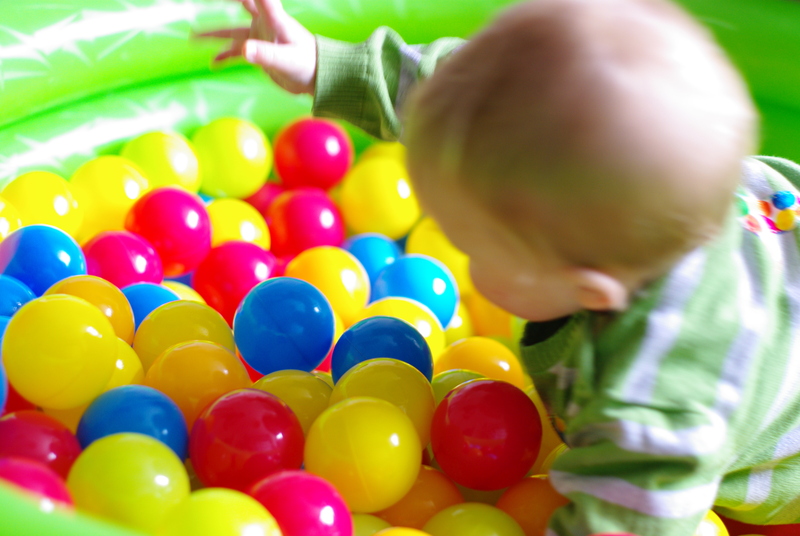 I won’t lie about being slightly apprehensive about holding a child’s birthday party, especially after reading this post from Free Our Kids. But the entire cost of the Tiny Overlord’s party came in at about £80 for over 30 people. And it created a lot of joy, personally for me doing my making and having a creative outlet, for our wider families getting together and celebrating and for our little family having something to mark this significant milestone in our life. If you want to see the Tiny Overlord’s upcycled party outfit, you can do so just here. "Every time I see an adult on a bicycle, I no longer despair for the future of the human race"